Born in Draper Township of Muskoka District in Ontario, Cliff Spring moved west as a youngster. He played intermediate lacrosse with the New Westminster West Ends starting in 1900 through into 1905. In the summer of 1905, he went to play for a team in Kamloops but returned to New Westminster the following year to play a season with the New Westminster Reginas. While with the Reginas in 1906, he also appeared in between the posts as a call-up goalkeeper for the senior Salmonbellies. In 1907 he found himself back with the West Ends intermediates but then soon turned senior full-time that same year with the New Westminster Salmonbellies. No other pair of brothers dominated the game during the professional era quite like the Spring Brothers, Cliff and Gordon – or better known to their fans and opponents as ‘Doughy’ and ‘Grumpy’. 18 percent of all the pro goals scored on the Coast between 1909 and 1924 were scored by a Spring. 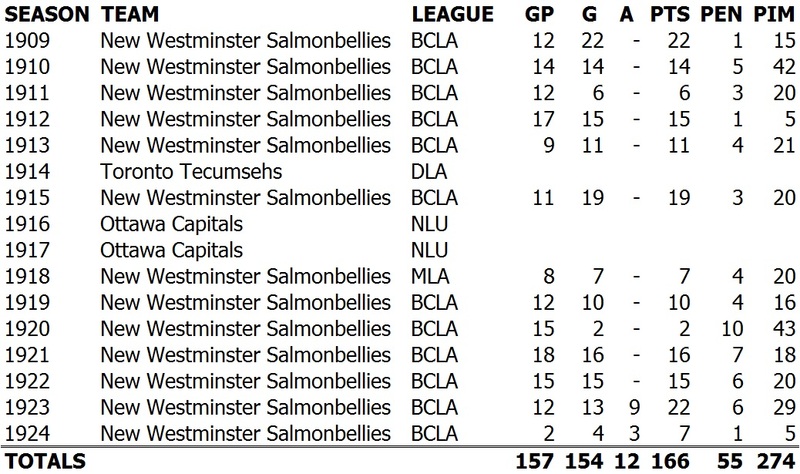 On New Westminster, ‘Grumpy’ Spring accounted for almost 19 percent of the Salmonbellies goals while brother ‘Doughy’ accounted for another almost 15 percent of the goals – keep in mind that ‘Grumpy’ did not play in the Salmonbellies’ last three professional campaigns. Therefore, their careers combined, the Spring Brothers were responsible for one-third of New Westminster’s goals. Cliff Spring looking at memorabilia during the 1960s. When trying to determine which one of the Spring brothers was the better player, it boils down to comparing raw statistics with raw ability – and statistics don’t always paint a clear picture. Statistically speaking, brother ‘Grumpy’ would be ranked the better player on account of his goal-scoring – but as a student of the game played on the field, Doughy would be regarded the better player due to his knowledge and ability to play, competently when required, in any position on the field – including between the posts in goal – although his usual territory was in the midfield. Meanwhile his brother ‘Grumpy’ was really only dangerous and effective when parked in the vicinity around the enemy crease. Cliff Spring led all professional players on the Pacific Coast with 157 career games played between 1909 and 1924. Ranked behind his brother Gordon, Cliff was second in all-time pro scoring with 154 goals and third in penalties with 55 infractions accounting for 274 minutes – ranking him at 8th for time spent sitting in the sin bin. Regarded as one of the finest stick-handlers developed, ‘Doughy’ was known for foregoing any form of protection, preferring to play barehanded and bareheaded. Unlike his brother Gordon who played his entire lacrosse career for the New Westminster Salmonbellies, Cliff was lured to Ontario along with team-mate Len Turnbull in 1914 when they signed with the Toronto Tecumsehs of the Dominion Lacrosse Association. Appearing in all 18 matches for the last-place Tecumsehs, ‘Doughy’ Spring finished tied for sixth place in the league for goals with 24. He returned to the Salmonbellies the following season but 1916 then found lacrosse in British Columbia suspending play for the remaining duration of the Great War. With the offer of a job and a split of the gate receipts, Cliff Spring packed up his bags once again and went back East – this time signing with the Ottawa Capitals of the National Lacrosse Union. ‘Doughy’ scored 32 goals in 18 games to lead the Capitals in goals and he finished fourth overall in league scoring in 1916. Unfortunately, his time spent playing in the NLU saw him experience something he was not familiar with back home in the Royal City: losing, as Ottawa limped to mediocre results in the standings during his two seasons. In his three seasons played in Ontario, he never saw a winning season. Knee problems almost forced him to retire after the 1921 campaign. The legendary ‘Bun’ Clark then retired and New Westminster was suddenly left without a goalkeeper – and at one point heading into the 1922 season it appeared the 34-year-old ‘Doughy’ was going to take up business in net. While most players are winding down their careers at this stage due to age and injuries catching up with them – and with his brother now departed from the playing field – ‘Doughy’ nevertheless persevered and saw some of his finest seasons played for the Salmonbellies in the early 1920s as the field game began to regain some of its former popularity. However, like everyone else in the professional ranks, he was sidelined when the game died in June 1924. In other sports, Cliff Spring was an accomplished basketball player during his youth starring for local New Westminster teams (along with various lacrosse team-mates of his) from 1902 to 1908 for the Armouries and Columbian College squads – winning a provincial title in the 1907-08 season. After he moved to Abbotsford, he once again took up the hooped game and played the occasional game representing his new home town. His only known dalliance with Canada’s “other” national pastime saw him, somehow managing to slip under the radar as an amateur, suit up as the goaltender for an ice hockey team from the rural Alberta town of Three Hills during the winter of 1918-1919. At the age of 46 and ten years away from the game, ‘Doughy’ Spring took advantage of the reinstatement of the former professional players into the amateur ranks to sign with the New Westminster Adanacs of the Inter-City Lacrosse League in 1934. Making the transition now from field to box lacrosse, he managed to score 9 goals in his 7 games with the Adanacs. The following season, now playing for his brother ‘Grumpy’ who managed the Salmonbellies, Cliff found his old form as he racked up 49 goals and 8 assists in 18 games for New Westminster. He played one last game for the Salmonbellies in 1936 before calling it quits and hanging up the gutted stick for good. Cliff ‘Doughy’ Spring was an obvious choice for charter membership induction to the Canadian Lacrosse Hall of Fame in 1965.